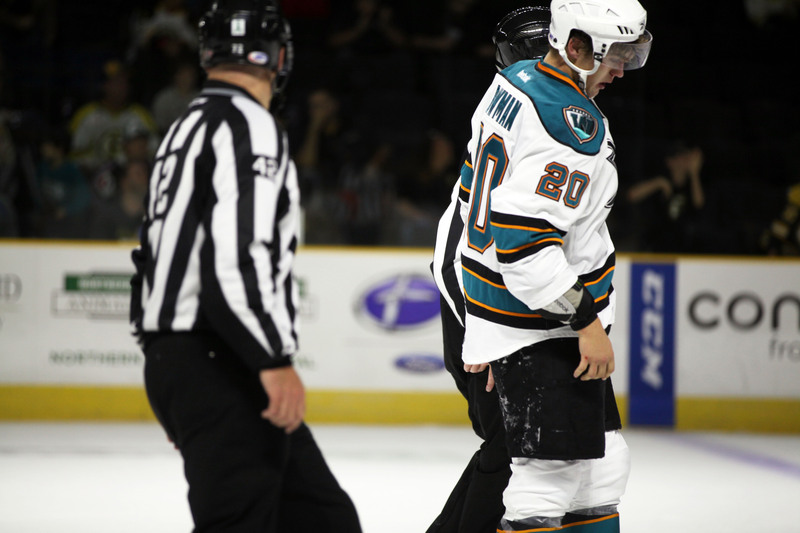 Undrafted 2nd year defenseman Collin Bowman(20) had a strong rookie season with home state team Colorado Eagles. In 69 ECHL games he scored 11 goals and 23 assists (tied for first in points), while adding another pair of tallies and 3 helpers in 6 Kelly Cup Playoff contests. He also had over 100 penalty minutes in his first year. Traded in the off-season to San Francisco Bulls, the 6’3″ 215 lbs. blue liner quickly signed a 2-way AHL contract with Worcester Sharks and appeared in their training camp before being reassigned back down to start his sophomore campaign. He didn’t exactly put up the same kind of numbers with his offensively challenged new squad and recently had his playing rights swapped (with the blessing from the parent club) to Bakersfield Condors. The younger brother of Carolina Hurricanes’ Drayson Bowman has skated 3 times with his new team and although he’s only bolstered his 2nd year totals by an assist, he has been a part of a pair of victories and one shootout loss on their current 4-game unbeaten streak. Given the opportunity in the higher league, the 22-year old has all the qualities of becoming an impact player as he continues to develop. He was a member of the 2009 WHL Championship Kelowna Rockets. Undrafted rookie defenseman Mike Cornell(4) spent five seasons in the Eastern (Junior) Hockey League starting as a high school age player before skating four years at University Of Maine. where he served as team captain in his final campaign. He signed an ato out of college with Florida Everblades and appeared in 6 games dishing 4 helpers and also played in 13 Kelly Cup Playoff games, where he recorded 5 assists with a +8 rating through a pair of rounds before getting eliminated. The not exactly huge out there 5’11” 190 lbs d-man plays a very physical game guarding the zone with his life pretty much. To begin his first year pro he re-signed with the Everblades scoring his first goal and adding 5 assists in 12 ECHL games. He also owned a tidy +10 plus/minus. 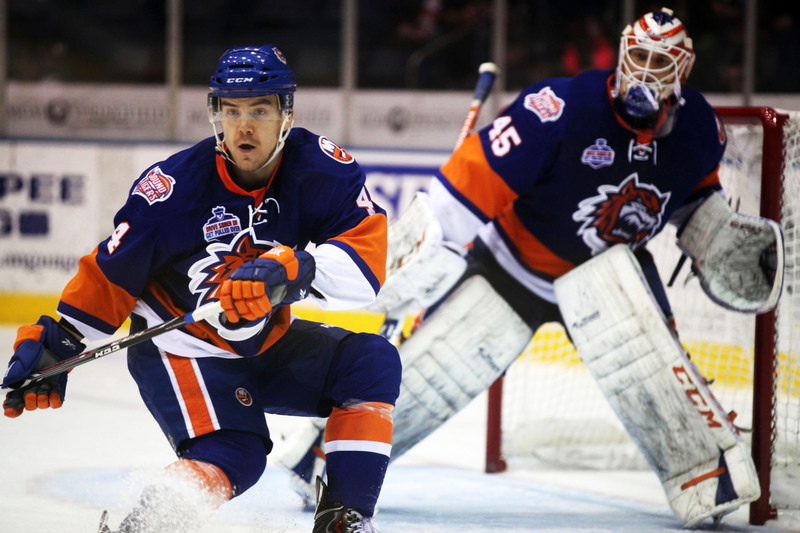 Only a month into the season Bridgeport Sound Tigers came a-calling and signed him to a pto. He fit right in to the team’s style pretty much from the get-go and before you know it he’s 26 AHL games in and inked an spc to stay. The late starting 25-year old has two goals and 5 assists with a -5 on a young squad that struggles at times. He also has a coach that’s been telling him to shoot the puck, because he’s already put 47 shots on net and that’s definitely added to his ability to connect on the score sheet. This one gets a #nicesurprise. 3rd year undrafted center Gabriel Levesque(12) decides to switch up his hockey landscape, leaving Stockton Thunder to join the lower Central Hockey League Quad City Mallards for the 2013/2014 season. The very small but speedy forward with good hands skated in the ECHL for his first two campaigns registering 18 goals and 42 assists in 94 games. 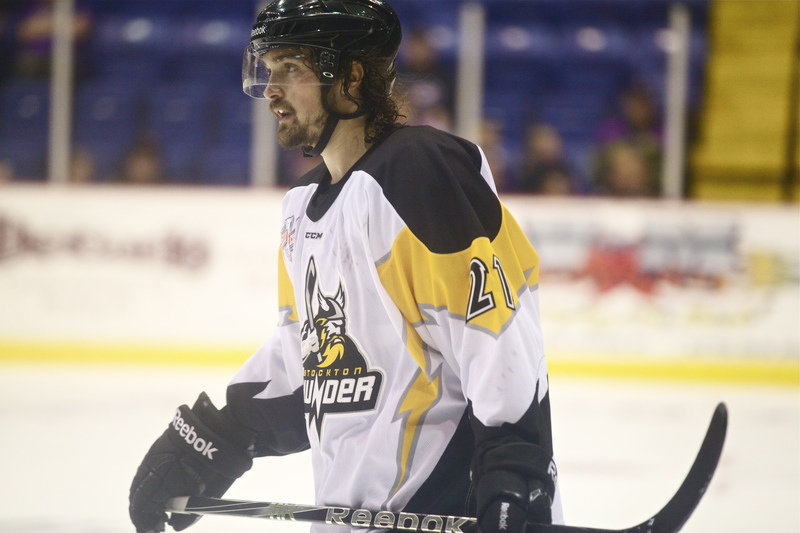 He also suited up for another 27 Kelly Cup Playoff games with the team going all the way to the Finals last season. At only 5’7″ 160 lbs. there’s no doubt he could be viewed as a bit of a punching bag out there but has proven he can strike gold on the score sheet. In four years of QMJHL he lit the lamp for almost a point per game production and in his last season was the league’s assist leader putting up 70 helpers and 38 goals through 68 games. He started his pro career on an invite to Worcester Sharks‘ training camp but was quickly sent down. There’s little doubt the 23-year old will put up big numbers and likely either transition back to a higher level of play or look overseas to continue his quest. Phoenix Coyotes‘ 4th round pick in the 2009 draft (#105 overall) defenseman Justin Weller(27) was assigned to the club’s double A affiliate Gwinnett Gladiators to start his second pro season. He’s signed to a three year entry level deal, but failed to appear in the parent club’s training camp after prospect camp and reported to Portland Pirates‘ to skate in preseason games before recently getting cut. This is the final year of his contract. At 6’2″ 205 lbs. he has fairly good size but has yet to crack even their AHL team’s roster. In 65 ECHL games in his rookie season he scored a pair of goals and 9 assists with a +7 rating. He added another tally and a helper in 10 Kelly Cup Playoff contests. The 22-year old played 5 years of junior hockey in the WHL with Red Deer Rebels but was never a big point producer, favoring maybe a bit more of a stay-at-home defensive style. If he can shine in his sophomore campaign, he may still be left unqualified going into 2014/2015, but could find himself a nice home for hockey overseas or look to continue to climb the ladder through the minors in North America. Undrafted left wing Andrew Clark(21) signed a one-year deal to continue with Stockton Thunder for his rookie season. 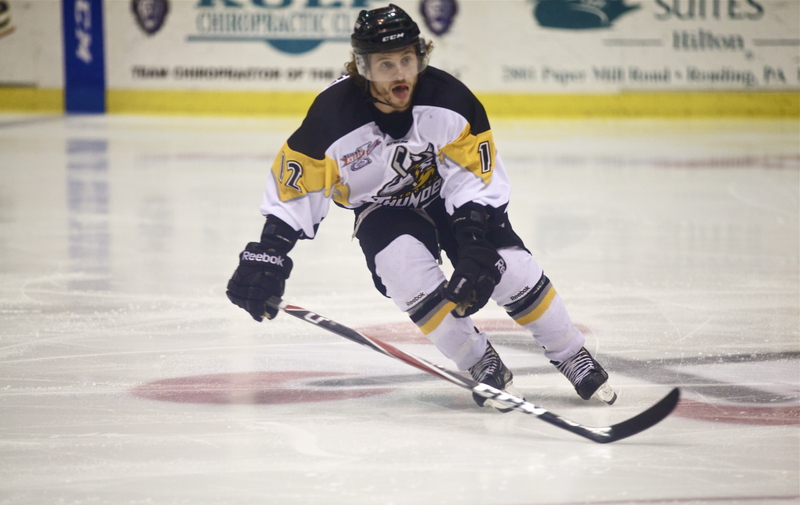 Taking a longer route than most players before turning pro, he spent four seasons in juniors with Brandon Wheat Kings and then headed off to Acadia University, where he continued the scoring tear he started in his final WHL campaign, putting up more than a point-per-game. The 5’11” 178 lbs. forward signed an ato when he was finished with his college career and promptly got right to dotting the score sheet with points. 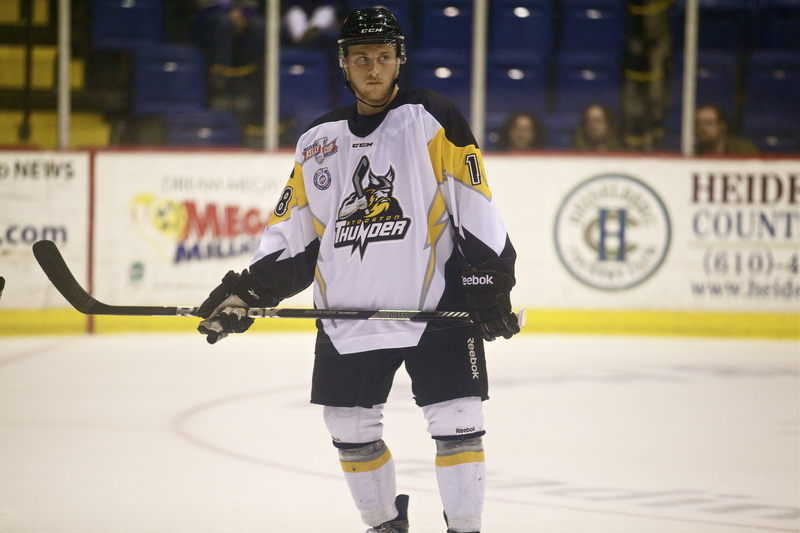 In 4 ECHL games he notched 3 goals and a pair of helpers. He stayed on course through 22 Kelly Cup Playoff contests, adding another 7 tallies and 14 assists, good enough for third on the team in playoff points. The 25-year old could find himself on a short list for a call-up, if he can stay hot. Undrafted 3rd year defenseman Mike Little(5) gets traded to Florida Everblades from Stockton Thunder right before the start of the 2013/2014 season. In 134 ECHL games with the team he scored 18 goals and 57 assists with a +19 rating. 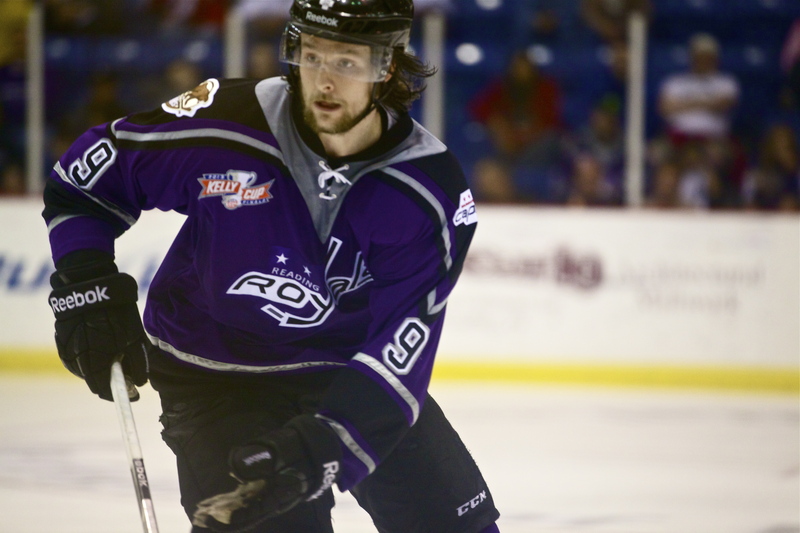 He also has tallied another 9 assists in 31 postseason contests and skated in all 23 2013 Kelly Cup games against the ultimate champion Reading Royals, ironically the team he started his pro career with in 2011 after four years of college hockey at American International. The change of scenery and switch to the Eastern Conference may continue to elevate the small 5’9″ but wide 195 lbs. blue liner defend his zone. The soon-to-be 26 year old could be just starting to catch his stride. We expect to see career highs this season. 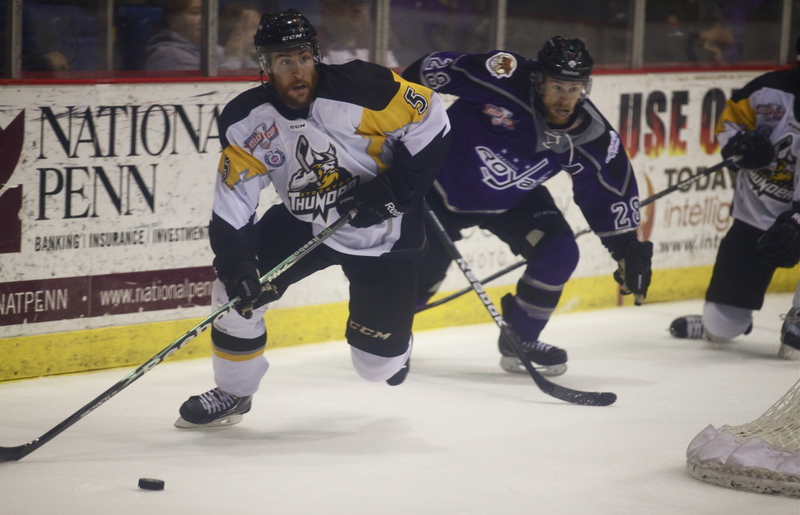 Undrafted, 2nd year left wing signs on for another season with ECHL Stockton Thunder. In his rookie campaign he skated in 59 games scoring 11 goals and 18 assists with a +6 rating. He added another 6 goals and 4 helpers in 22 playoff games all the way to the 2013 Kelly Cup Finals. The 5’11” 181 lbs. forward doesn’t look like the biggest guy on the ice but he’s starting his pro career much the same way he did in his first season with Providence College Friars. He posted his best point totals as a first year guy but they continued to decline until graduating. He’ll definitely be looking to avoid a sophomore slump but chances are the 23-year old will continue to step up his game. 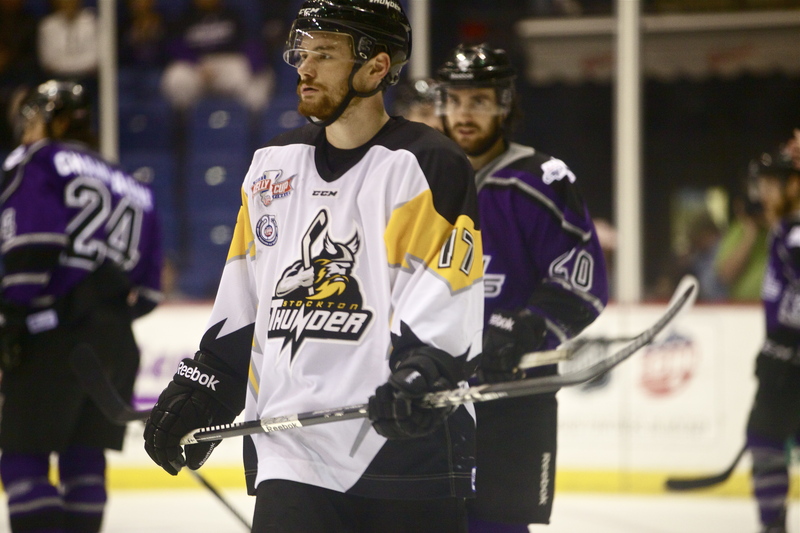 Undrafted 3rd year right wing Ryan Hayes(18) played for three different ECHL teams last season after being involved in a pair of trades that eventually brought him to Stockton Thunder to finish out the remainder of 2012/2013. And what a finish it was. In 12 games he scored 5 goals and added another 6 assists bringing his totals to 14-13-27 in 40, which was under what he put up in his rookie campaign but close and in 23 less games played. Great marks all around for the only 5’9″ 185 lbs. forward but once it hit playoff hockey time he stepped his scoring output to the next level. In 23 Kelly Cup postseason match-ups he was able to strike for 9 tallies and 15 helpers while going a +8, good enough for 2nd overall in scoring. Those postseason numbers were in line with what he attained in 22 OHL playoff games with Plymouth Whalers (12-13-25). Very smartly Stockton taps into his scoring performance for another season signing him to a one-year deal. It won’t be surprising to see the 24-year old earn his first AHL call-up or appear in a higher league training camp. 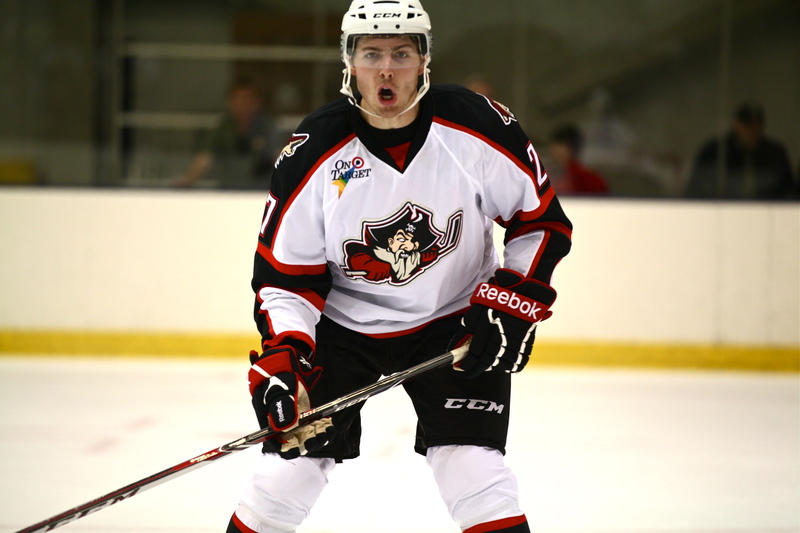 Undrafted 4th year giant-sized defenseman Dustin Stevenson(9) signs a 1-year deal to join Wilkes-Barre/Scranton Penguins for 2013/2014. After his 3-year entry level contract with Washington Capitals was up, he was not qualified for the upcoming season and became an unrestricted free agent. The 6’5″ 220 lbs. d-man was always in the parent club’s training camp and released to AHL‘s Hershey Bears but never found a roster spot and reassigned double A affiliates. 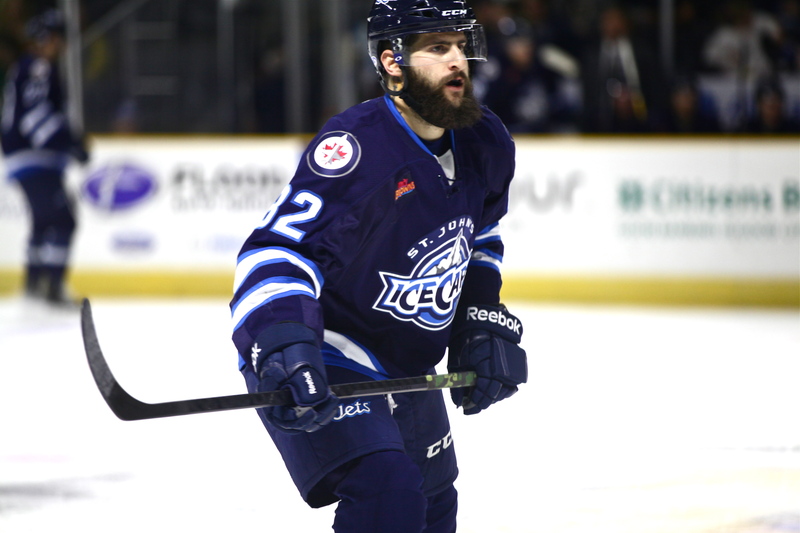 He has skated in 200 ECHL contests (3 goals, 26 assists) in his first two years with South Carolina Stingrays and won a Kelly Cup Championship last season with Reading Royals. His game has never been about scoring. He’s seen as more of a steady, shutdown blue liner that’s tough to play against. The soon-to-be 24-year old did however connect for a goal and 8 assists in 22 playoff match-ups with a +17 rating. He also put up big points in 3 seasons of Saskatchewan junior hockey, so it’s possible those offensive abilities have been kick started and will blossom in his new environment.